(Captured 7-6-16) Charleston Police looking for this suspect that committed an armed robbery to Hunleys Tavern this Sunday. | Crime Stoppers of the Lowcountry: 554-1111 | 1-888-CRIME-SC | Anonymous tips earn cash rewards with Crime Stoppers of the Lowcountry. Home | News | (Captured 7-6-16) Charleston Police looking for this suspect that committed an armed robbery to Hunleys Tavern this Sunday. (Captured 7-6-16) Charleston Police looking for this suspect that committed an armed robbery to Hunleys Tavern this Sunday. Charleston police are asking for your help identifying a suspect in an armed robbery. 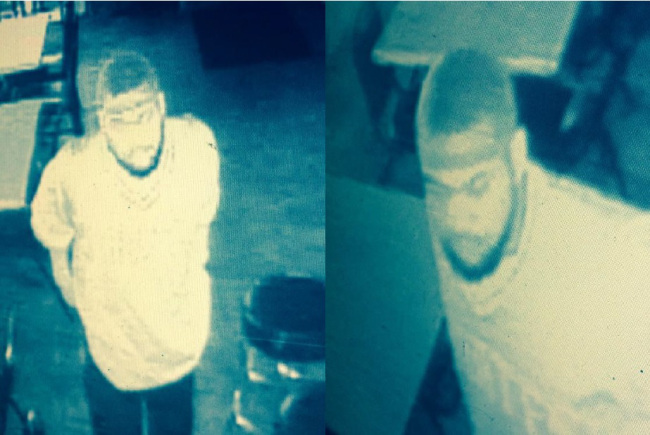 Authorities say the suspect, pictured above walked into Hunley’s Tavern at 1750 Savannah highway Sunday morning at about 12:52a.m. The suspect is described as a black male, 6’01-6’03 in height with a thick build. He was armed with a handgun. The suspect was last seen in the area of Savannah Hwy and Wappoo Rd. If anyone can identify him or has any information about the crime, you’re asked to call Consolidated Dispatch at (843)-743-7200 and ask for the on-duty CPD detective or call Crime Stoppers at (843) 554-1111.